1. Place the shredded cabbage in a bowl with the horseradish, soured cream, chives and lemon juice. Season and toss together; set aside. 2. Heat a griddle pan over a high heat. Brush the bread on both sides with a little oil, then griddle for a minute on each side. Put the griddled bread on a plate and top each slice with a quarter of the cheese. 3. Brush the steaks with the remaining oil and season. Griddle for 2 minutes on each side for medium rare. 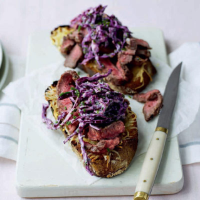 Slice thinly and pile onto the bread, topping with a mound of red cabbage. Serve immediately.